The spider-web tattoo atop Tim Armstrong’s head should have been a dead giveaway. Once you start inking above the chin, you’re pretty much punk for life, and no matter how poppy or progressive Armstrong’s band Rancid became in the mid-to-late ’90s, it was never really going to leave the genre behind. By then, Armstrong and his fellow East Bay travelers—bassist Matt Freeman, singer and guitarist Lars Frederiksen, and drummer Brett Reed—were too immersed in the subculture. Going all respectable and rebranding as “rock ’n’ roll” would’ve made them look silly. This was way less of a problem for The Clash, the style-busting group to which Rancid has always been compared; after talent and taste, it was a lack of tribal allegiances that allowed that U.K. foursome to transcend punk and make records like Sandinista! and London Calling. Had the four talented, tasteful guys in Rancid met 15 years earlier, before punk had calcified into a lifestyle choice, they might have done likewise. But fate had them crossing paths in ’90s Berkeley, California, where punk was very much a defined thing. Maybe that’s why Rancid has managed only one album, 1998’s Life Won’t Wait, that truly comes close to matching The Clash’s powerful and far-reaching concept of what rebel music can entail. Ambitious, well crafted, and endearingly overreaching, the 22-track set nearly vaulted Armstrong and the gang out of the stylistic dead zone they’ve since nestled back into. Hard to believe, indeed. Eddy is a touch too generous with his praise, but he’s right in calling out Rancid for its energetic use of Jamaican rhythms. Unfortunately, there are only two ska tunes on the album—“Time Bomb” and “Old Friend”—and they’re basically the same. True, London Calling only has one stretch of proper ska bounce, but it comes on “Wrong ’Em Boyo,” a cover of both the 1967 Rulers song of the same name and “Stagger Lee,” the 1959 Lloyd Price hit on which that was based. The intro section reps Price, and those 30 seconds of vintage American R&B account for just one of the many, many styles that share space with ska on the diverse two-LP set. 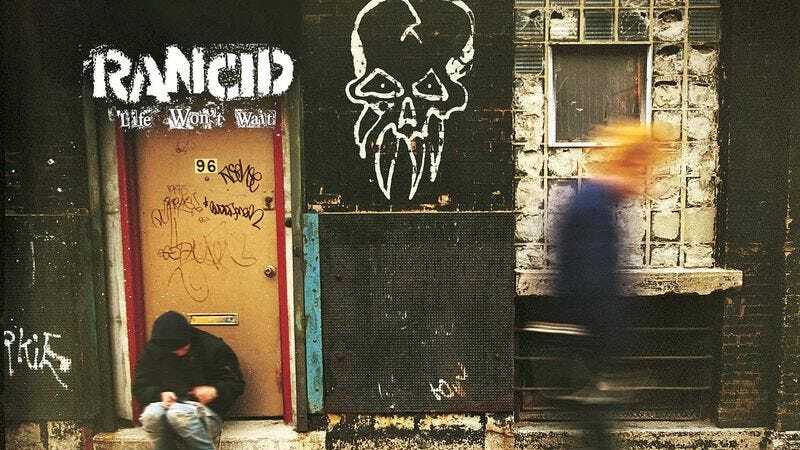 Wolves may be Rancid’s most consistent, front-to-back enjoyable album, but it’s fairly two-dimensional: 90 percent circle pit, 10 percent skank. Oakland Calling it ain’t. If Rancid’s third album wasn’t as great as The Clash’s, Armstrong and Frederiksen didn’t take another stab at matching it. With Life Won’t Wait, they effectively (and perhaps intentionally) did what The Clash did with its fourth, Sandinista! Released in 1980 and spread out over three LPs, Sandinista! is globalist in sound and scope, punk gone Putumayo. The songs center on upheavals in South America and beyond, and musically, there’s gospel, hip-hop, disco, Celtic fiddle rave-ups, and tracks played backwards—all daring listeners to hang in as long as possible. Make it to side six, and you’ll hear little kids singing “Career Opportunities,” a punk tirade from The Clash’s self-titled 1977 debut. The song that follows, the blunt fist-pumper “Bloodclot,” falls short of that promise, but when Lars sings, “I can see 360,” he might as well be talking about the next half-dozen tracks. Track three, the piano-accented drug ballad “Hoover Street,” gives way to “Black Lung,” a slashing show of solidarity for oppressed coalminers. From there, it’s down to Kingston for the title track, a fat slab of conspiracy-theorist dub, followed by “New Dress,” a rollicking sing-along linking wars in Belfast and Bosnia. “New Dress” contains the lyric “Yugoslavia’s been blown to bits,” so from there, it’s no great leap to “Warsaw,” a breathless rhythm-section workout about Polish rioters swinging Louisville Sluggers. Three members of British ska legends The Specials turn up on “Hooligans,” a call for unity among rude boys and anti-racist skinheads. Rancid had tackled scene politics before—check out “The Ballad of Jimmy & Johnny” on 1994’s Let’s Go—but “Hooligans” goes beyond local knuckleheads fighting over fashion and what bands it’s okay to like. There’s something at stake—or so those kids peacocking around in Fred Perry shirts tell themselves. Elaborating on the album’s title in a Rolling Stone Q&A, Frederiksen sounded like a guy who’d done his homework—and maybe read a little Orwell. It always amazes me how America gets a new enemy every five years or whenever it seems the population is turning to look at the government itself—the real enemy,” Frederiksen said. “We had the Cold War for fifty years, we had Castro somewhere in the ’60s, then we had Saddam Hussein, Muammar Qaddafi, Ayatollah Khomeini, Saddam Hussein again, Noriega. They shift your views somewhere else so you’re not actually looking at the real threat. Because the biggest threat to the American government is the population itself. At least a third of the 22 songs are unlike any Rancid had attempted before, and even the more straightforward tracks attack in unexpected ways. Taken in total, Life Won’t Wait was enough of a departure to warrant some Sandinista! talk, though Rancid didn’t necessarily see it that way. Ultimately, Reed was probably correct to pooh-pooh those Clash comparisons—though for the exact opposite reason. For all its passport-stamping and style-shifting ways, Life Won’t Wait traffics in sounds that other bands—The Clash chief among them—had already spliced into punk’s DNA. In 1998, for Rancid to truly have made its Sandinista!, it would’ve had to incorporate popular music from its time and place: big-beat Chemical Brothers techno, gangsta rap, and maybe even teen pop. The jail reference is telling. Where The Clash thought “prison break,” Rancid is cool with roomier cages.